Catholic Charities to build permanent home! 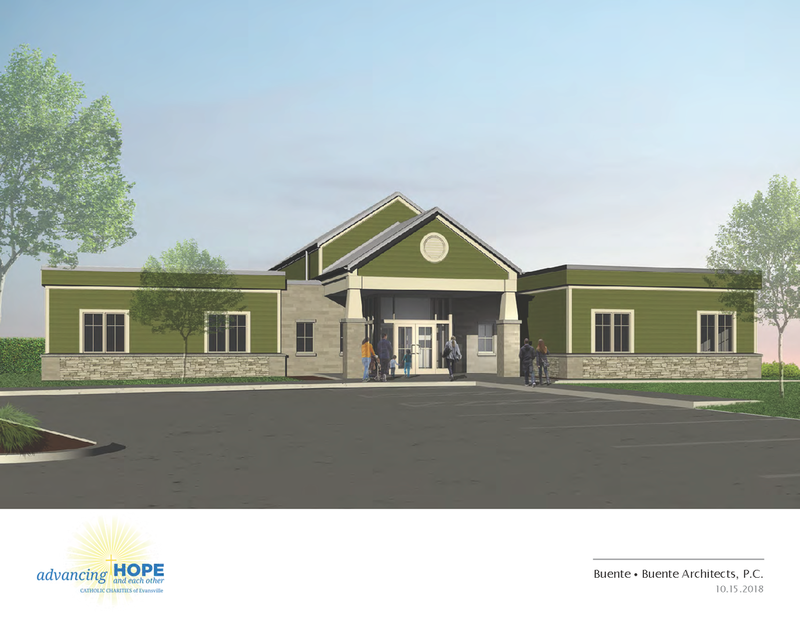 Catholic Charities new, permanent home will be located on the corner of Stringtown Rd. and Herndon Drive, just south of the 'old' North High School. The 9,800 square foot building will house 20 offices and three large meeting spaces. We look forward to moving in Spring of 2020. Thanks for the generosity of all parishioners who supported us through the Stewards of God's Grace Capital Campaign! 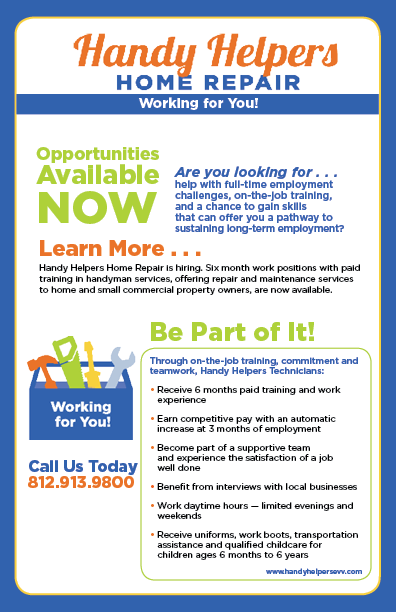 Catholic Charities is opening a home maintenance and repair service that will employ individuals who struggle with finding and keeping a job. If you are interested in applying, please fill out the application and return to the Catholic Charities office: 610 E. Walnut Street; Suite 220A, Evansville, IN 47713. Handy Helpers Technicians Enjoy Success! When M. joined us as a Handy Helper technician, his wife and six year old son lived in a shelter. He had worked sporadically but had difficulty holding a job. He did not have a high school diplomas. After six months working in our social enterprise, M just accepted a job paying over $17 per hour PLUS benefits with a local construction contractor. He took his high school equivalency exam this week and is awaiting a positive outcome. With a second child on the way, his family picture is looking up. Help Us Create Lives That Work! Yes, I will pray for your work. Yes, I will pray and volunteer to help. Please email me. Yes, I will pray and donate. Please click below also. Catholic Charities would like to extend our thanks to Mills Body Shop, Uebelhor Chevrolet, Heritage Federal Credit Union, All in the Family Dental, Atlas Logistics​, ECS Solutions, Good Shepherd Knights of Columbus, Gibson Southern High School Football Team, and Mater Dei Students for their help! Catholic Charities is pleased to be a United Way funded agency. Thanks to all who make funding possible! As of July 1, 2018, there has been a change in the laws regarding the release of birth parent information to adult adoptees. Please follow the link to learn more. Catholic Charities kicked off its Emmaus Project on April 3, 2018! The Emmaus Project is a one-to-one adult mentoring program for at-risk employees of local businesses. Did you know that almost 40% of new employees in manufacturing/labor industries in the Evansville area quit or lose their jobs within the first 30 days of employment? You can help turn the tide! Mentoring is an intense volunteer activity. We are looking for twenty individuals to commit to mentoring at-risk employees (young parents, those not holding a high school diploma, or with incarceration histories) so that they keep their jobs and are able to sustain themselves and their families. Training will be held in early March. Click here if you're interested in mentoring. ​What would you pay for a good counseling session? $19.71. That’s the average fee paid by counseling clients for a one-hour session with a Catholic Charities Licensed Social Worker. Three counselors serve hundreds of individuals, couples and families each year in Evansville, Jasper, and Vincennes. The goal? Ease client stress; facilitate client growth to a place of positive, self-sustaining mental health. Mission accomplished. Average Outcome Rating S﻿cale® scores exceeded national averages. Call 812.423.5456 for an appointment at any of our three locations. Catholic Charities Advisory Board meets bimonthly. Meet the members of the board here. Catholic Charities received a two-year, $60,000 grant from the Welborn Baptist Foundation to design and implement the Emmaus Project, an adult mentoring program. 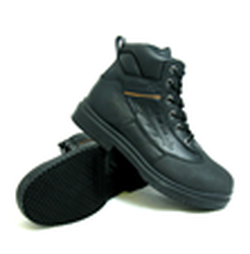 Did you know that an $100.00 pair of steel-toed bo﻿ots is a common barrier to work in our Southwest Indiana? Each month many individuals in our community turn down employment because they do not have the money to buy the required footwear to start a job. 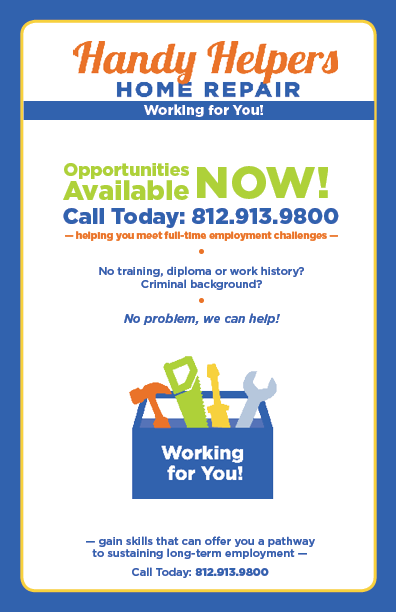 Catholic Charities collaborates with local employers to ensure a person who is offered a job can go to work!